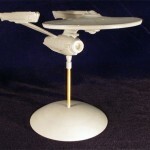 You are currently browsing the Collector Model blog archives for August, 2009. Sorry to be away for so long. We’ve finally gotten through our yearly sales summit. It seems that our ideas for new model kit product for next year went over pretty well. Full steam ahead! I’m heading out for a week’s vacation so it’ll be while before I get back on my regular blog schedule. In the meantime, I’ve prepared a couple more quick hits. The post following this one will be mysterious but probably incredibly exciting to some (hopefully most) of you out there. Before I go, though here’s a pretty exciting little tidbit itself. 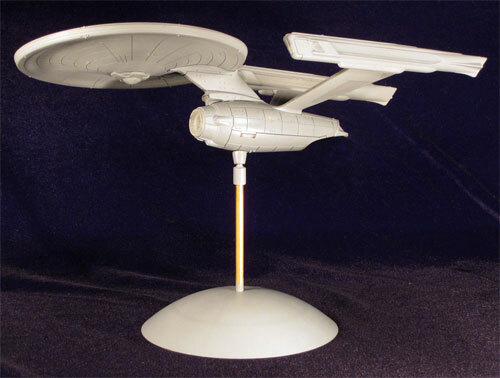 When we release our Vulcan Shuttle Star Trek model kit later this year, it will feature brand new box art. We are very proud to announce that we have had the ship’s designer, Andy Probert, do a brand new illustration of the ship! We are pretty stoked. We will feature an interview with Andy on our website when the release date gets closer. So here is a sneak peak at the illo. Of course we will add the licensor’s mandated background elements and a few extra bells and whistles to tie the look into our other boxes. Hope you enjoy. I have to admit, I’m hesitant to show this off. Not because I don’t want anyone to see it, but because I don’t want to hear any feedback at this point. 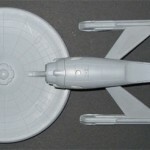 The kit will undergo some revision before tooling that will correct some of the eyesores that may be pointed out. I’ll address a couple things up front but it is not a comprehensive list of issues. All issues are being ironed out as I write. I’m sure everyone can see the chasm-like panel lines. I had the same reaction when I saw the images of the mockup come in from the factory. That is the primary reason I blurred the last set of images. After seeing it first hand, it isn’t as bad as it shows in a photograph. They will be worked on believe me. 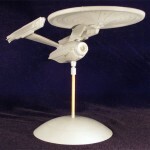 The other huge issue to be resolved is the deflector dish. It is way too thick. I’m really not sure why it was so hard for the mockup folks to grasp. Like I said, it will be corrected. No worries. The part breakdown will have a few revisions too but nothing that won’t be appreciated. Special attention is being paid to this kit from a painter’s perspective. I’ve tried to make it as paint friendly as possible given the size of the kit. I’m betting we will get some requests on these areas to revise the 1/350 kit to build the same way to make it easier to paint. 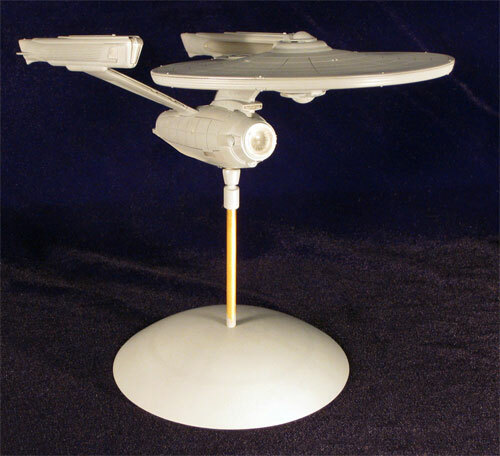 These are the kinds of things we will really pour over in the development of our 1/350 TOS kit. The mockup builds up great I think. 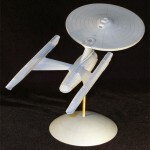 If all goes well, we will have a U.S.S. 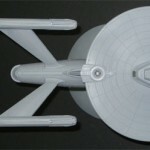 Enterprise Refit 1/1000 scale buildup at iHobby in October. Jinkies! 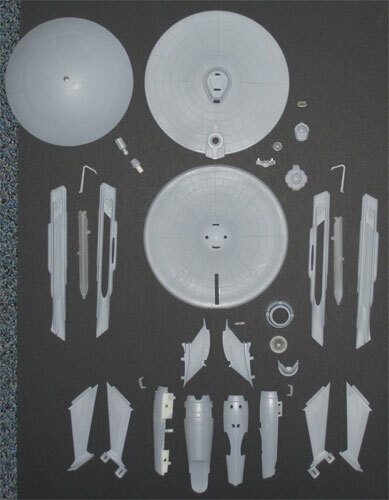 We’ve been busy working on our Polar Lights model kits! So, how’s it going for you guys? We’ve been incredibly busy around here and its tough keeping our heads above water. We’ve been finishing up lots of packaging and instruction sheets for upcoming Polar Lights model kits releases. I’ve missed having a chance to write about some of our recent developments. We’ve been getting ready for a big sales presentation to our reps for all of our brands for next year’s products. It gives us a chance to fill them in on what we would like to do and get their input about our product. On top of that, we are putting together mini catalogs for inclusion in our model kits. We’ll be doing a full-blown print catalog in preparation for the big iHobby show in October. At that show, we’ll be unveiling our release schedule for the first half of next year. Needless to say, I’m pretty excited about our plans. 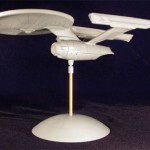 I’ve been giving final approvals on tons of test shots including the revised C-57D saucer sections which will now assemble to be a bit more sturdy and hopefully alleviate some of the edge warping that was prevalent in the earlier issue. Mr. Spock is looking good and he has a collar now. 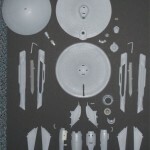 Finally, the UFO sprues now have part numbers on them. (Literally) I just heard that our second run of 1/350 Enterprise refits just came in and half of them are going right back out to distributors. Grab them while they are hot! 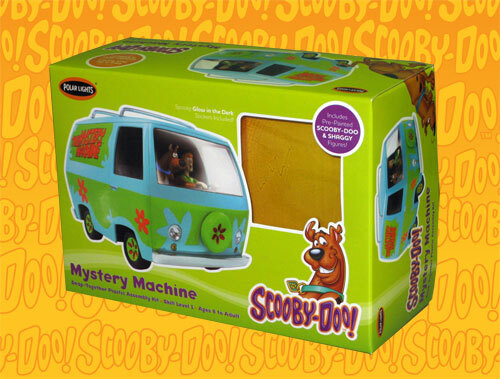 The thing I’ve been busiest with is the new Scooby Doo Mystery machine box and instruction sheet. I’ve had my hands in instruction sheets before but Bob usually handles the packaging. He says he really wanted to do it but he is juggling a lot. It was fun to do a package for a change. I had to deal with a licensor supplied style guide and we usually cringe at the thought. It wasn’t too bad in this case. Their new elements look pretty cool even though they aren’t as spooky as they should be. Rather than using as little of the style guide as possible, I actually used it to steer the rest of the design on the box sides, back and instruction sheet. I’m pretty satisfied with the results. Well, back to work on to the C-57D instructions.